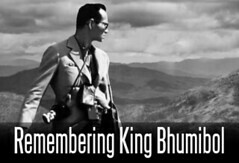 April 15, 2015 -- Progress Thailand We've covered accessibility issues before on Progress Thailand. Namely, we've covered many of the challenges wheelchair bound individuals and those with difficulties climbing stairs or crossing roads faced when trying to use Bangkok's mass transit system. While there has been many symbolic victories reported in the news, real progress is slow and sometimes frustrating. That is because the people charged with solving these problems are not the people suffering from these problems, and therefore the sort of urgency required to promptly address these issues is lacking. What if there was a way for the very people suffering from problems related to accessibility to begin working on solutions? What if they could translate their very real urgency directly into actions rather than depending on others? That is the hope and promise emerging personal manufacturing technologies may offer. 3D printers allow a nearly infinite number of designs to be made within its build area out of a growing number of input materials. You have a spool of material, a print space, and your digital file which can be nearly anything your imagination can conjure, and in a few minutes (or hours depending on how big and elaborate your design is) you have your idea as a tangible reality literally in front of you. 3D printing is perfect for making prototypes of objects to be later mass produced using a different means of production. It is also perfect for making anywhere from one to a few copies of a particular item. Designs can be highly customized from print to print, so for someone doing a prototype, each print could be an improved iteration of an initial idea. And because of these strengths, 3D printing is increasingly becoming good at solving problems yet solved by traditional manufacturing and distribution. Among these problems is accessibility for the disabled. For the blind or wheelchair bound, a sometimes unforgiving, unwelcoming world awaits. The harsh reality is that because a relatively small number of people are disabled, the "market" doesn't see much reason to accommodate them. The average person can go days or weeks without seeing someone with a disability. And because it doesn't directly affect them until bad luck leaves them or a loved one disabled, it is all too easy for them to pay little attention to this problem. Now, people who have seen this problem and have seen something wrong with the way things are, but lacked the resources to do anything about it, can make a difference using 3D printing. For the blind, deaf, wheelchair bound and other forms of disabilities, everyday tasks can become difficult challenges. Existing products and the benefits they confer that many of us take for granted are inaccessible to people with disabilities. In the past, specialty companies charging a premium would produce products designed for different kinds of disabilities. Amputees for instance, would receive expensive prosthetic limbs, if they could find them and then, only if they could afford them. Already, 3D printing has made inroads into dropping the price through the floor while improving the fit and function of prosthetic limbs in ways specialty companies never could. 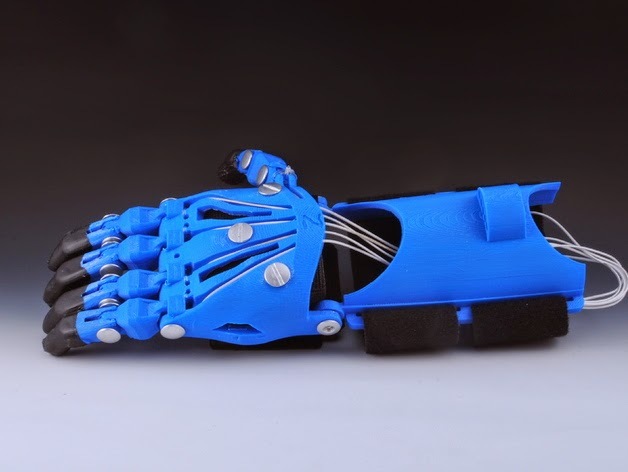 An open source project called e-NABLE has been inspiring people around the world to use 3D printing to fit amputees with cheap, but precisely fitted prosthetic limbs (find 3D files here to download). 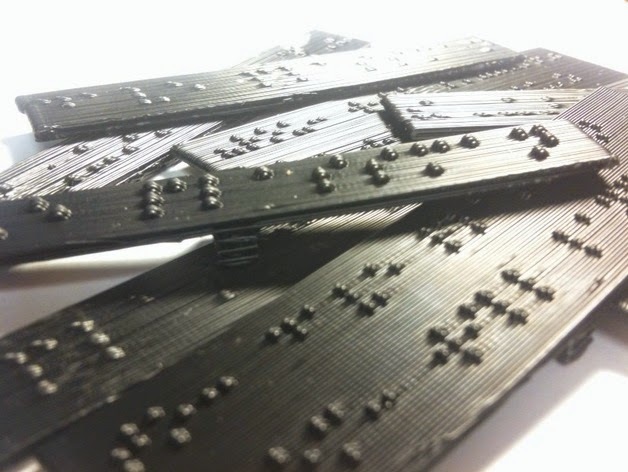 Visit MakerBot's Thingiverse 3D library online and type in "Braille" and see hundreds of results returned. Braille, a tactile writing system developed for the blind, uses tiny raised bumps across an otherwise smooth surface. Taking everyday objects and modifying them with Braille can be a very difficult and expensive process. With 3D printing, however, this becomes a lot easier. And not only does 3D printing allow people to design objects that could be of general use to all blind people, it can help people with very specific needs. Imagine a book with pictures in it. How would someone unable to see, enjoy the pictures? 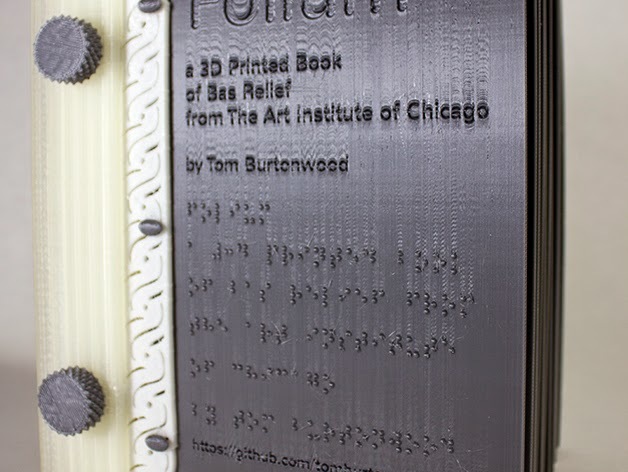 What if the pictures, say of sculptures, were printed in 3D with Braille captions explaining the scale of the model versus the actual objects described in the book. Wheelchairs are another category 3D printing is helping improve. With something as simple as a customized attachment to add function a particular user wants, the quality of their life can be improved. Remember that to move a wheelchair, the user must use their hands. While we walk, we may take for granted our ability to move our hands around or simply just carry something in them. Imagine a set of "helping hands" configured to exactly what a user wanted held and set at different heights to perform different tasks. As simple as it sounds, building something that works and is aesthetically pleasing would be expensive or altogether impossible for the average person. 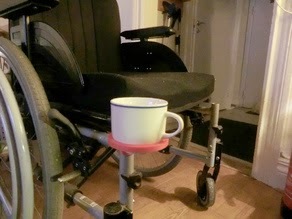 But on Thingiverse, we can find a growing collection of 3D printed accessories for wheelchairs that are functional and visually pleasing, not to mention incredibly cheap and infinitely customizable. With a growing number of makerspaces around Bangkok with their doors open to the public and their 3D printers ready to print what your imagination can conjure, those with disabilities now have an opportunity to design exactly what they need and have it created directly in front of them. Rather than depending on others, they can directly begin working on the solutions they themselves know they need, with the urgency, focus, and determination such solutions require. For now, 3D printing is a technology that is still being explored in general, to say nothing of what it can do in any particular field. That it is already making a big impact regarding accessibility is a promising sign. 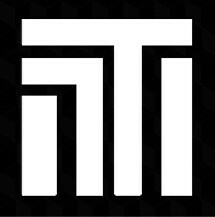 We hope one day personal manufacturing, synthetic biology, and regenerative medicine combined will make the issue of accessibility moot, with people able to walk, see, hear, and live without any disabilities at all. But until that day comes, we are no longer hindered by "the market" or costs, only by our imagination and ingenuity to take this new tool and use it creatively to improve the lives of those who need it the most.